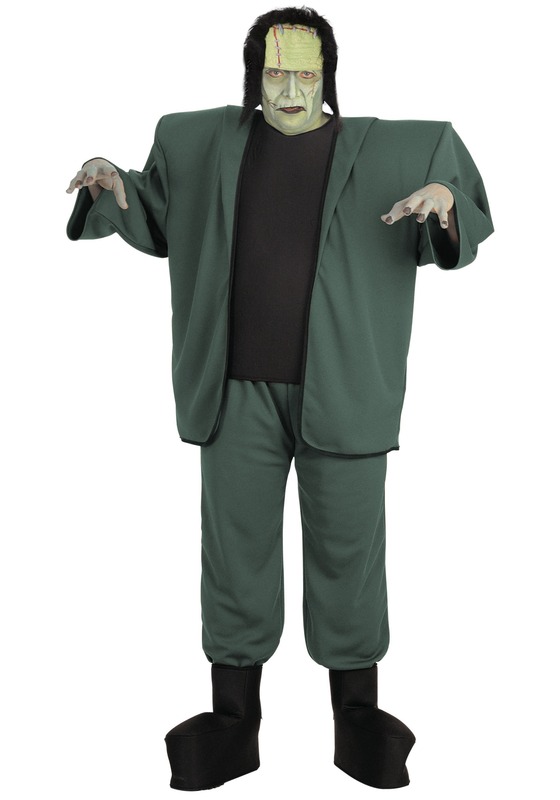 You'll be ready to do the Monster mash in this plus size Frankenstein costume. This plus size Frankenstein costume includes a jacket with attached shirt, pants with attached boot tops, and a headpiece. The headpiece features black synthetic hair along with a green rubber forehead piece. The hair is attached to a black foam piece. The jacket is made of green polyester and features a black foam chest. The top ties in back at the neck. The pants are also made of green polyester and feature an elastic waist. The boot covers are made of foam and tie in back at the ankle. Pair up with our Bride of Frankenstein costume for a scary couples costume idea!